In the indie thriller, Private Number, writer Michael Lane (Hal Ozsan, “Redline”) is under a lot of pressure. His first novel, Knight Fire, did reasonably well, and now, he’s really struggling to write his second. His loving wife, Katherine (Nicholle Tom, “Hang Loose”), has recently opened her own boutique and really, really wants to have a baby, but Michael’s resistant — he’s just not ready yet. Wait until I finish writing this book, he tells her; then we can talk about it. However, life isn’t that simple. Michael, a recovering alcoholic, has begun seeing and hearing things, and alarming as this would be for anyone, Michael is doubly worried because while he occasionally hallucinated when he was drinking, he never saw or heard things that weren’t there when he was sober. He starts receiving strange phone calls in the middle of the night too; calls in which new, unfamiliar voices repeatedly ask, “Remember me?” When their house alarm suddenly goes off, and Sheriff Stance (Judd Nelson, “Nurse 3D”) doesn’t take his and Katherine’s concerns seriously, Michael becomes determined to find his own solution to his problems. Taunted by whispers and visions of ghost-like men and women, Michael becomes obsessed with the late-night phone calls and resulting answering machine messages. He plays the messages over and over, and discovers that he can hear names whispered in the recordings. After a little research, Michael finds out that he’s hearing the voices of various murder victims, and resolves to save his wife, and his sanity, by solving the mystery of their deaths, and putting his torment to an end. Producer, writer and director LazRael Lison creates a character in Michael that is rather intriguing, but unfortunately, the story doesn’t properly support his development to the end. Private Number is an attention getter early on, wrapping viewers up in a husband-wife dynamic — work stress, the desire for a growing family, love and support for each other’s goals — that’s relatable to anyone in a relationship that’s lasted longer than few months. Michael credits his wife for his recovery, sharing at an Alcoholics Anonymous meeting that she is the reason he’s sober today. The performances by Hal Ozsan and Nicholle Tom are believable and engaging in the beginning of the film, and the unnerving nature of the late-night phone create a tense atmosphere for them. But as the movie continues, clichéd characters like Judd Nelson’s Sheriff Stance and creepy neighbor Mitch (Kyle T. Heffner, “Red Sky”) detract from the plot. Not even Tom Sizemore’s turn as psychiatrist and AA group leader Jeff helps to pull this one up from the depths. Worse, the middle of the film drags on and on and gets weighted down by ridiculous details: Michael becomes mired in a contrived murder investigation (somehow he gets a house-call tech support guy to rig his computer to hack into police databases — but only for 90 minutes?) and Katherine is mysteriously attacked by the unhappy spirits (seizures? possession? I’m still not sure). The resolution to all of this brings some interesting elements back to the forefront, but in general, it’s already too late. Even the open ending of sorts doesn’t deliver that quality bite a supernatural murder mystery really needs to bring it all home. 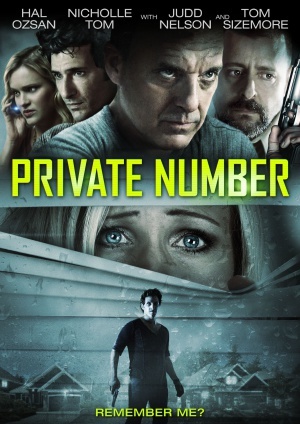 So while Private Number begins with a psychological edge and tries to close on a strong footing, its faltering halfway through causes it to, by the end, dissolve into a movie that’s ultimately a disappointing and dissatisfying could-have-been.